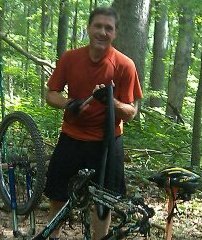 I’ve learned a lot about living a healthy life with type-1 diabetesÂ on my mountain bike. I do know one thing:Â aÂ vital skill in mountain biking is to look down the trail, past whatâ€™s right in front of you. When you look five to twenty-five feet down the trail (depending on the type of trail), you can identify potential hazards and challenges and create a plan of action before you reach them. Take it from me, constantly looking just ahead of your front tire results in a jerky, stumbling ride and some painful blunders. It’s the sameÂ for caring for my diabetes. IÂ can live either by defaultÂ orÂ design; in reactive or proactive mode. It seems to me that most people live most of their lives by default. In other words, life happens to them.They’re looking, figuratively speaking, just aheadÂ of their front tire. When I am struggling to keep my blood sugars under good control, I’ve learned that’s often a sign I am not being asÂ proactive as I need to be with my health. I may not be getting enough exercise or I’m not testing my blood as I should or it’s been a while since I’ve seen my endo. (By the way, an “endo” is not a good thing in mountain biking. It usually ends in a “face plant.” And no, tulips are not a part of a face plant.) Or I’ve eaten an entire gallon of dark-chocolate-chip raspberry ice cream (because, after all, raspberries and dark chocolateÂ are good for you), not that I’ve actually ever done that. 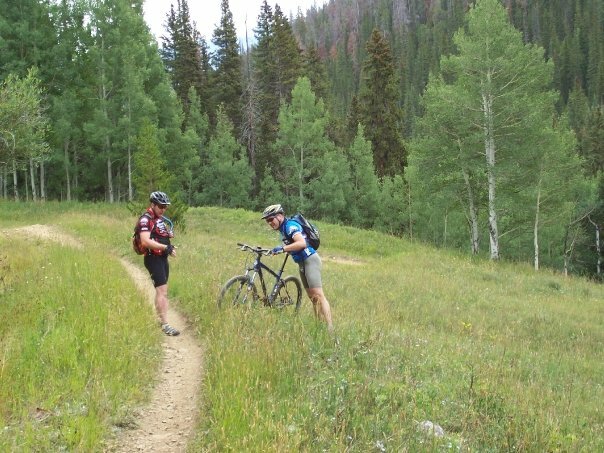 In mountain biking as well asÂ in caring for diabetesÂ (or anything, for that matter), weÂ want to make decisions beforeÂ weÂ actually get there (wherever â€œthereâ€ is at the time). It helps to know where you are going, not just where you are at this moment. I talk to people with diabetes all the time, and many of them live in reactive mode. Their longest range plan is what they are having for lunch. You’ve probably heard the old expression, but it’s true: A failure to plan is a plan for failure. And for those of us who live with diabetes, that plan for failure can be deadly. When Iâ€™m mountain biking and I start thinking I might crash, guess what often happens? Yup . . . Wham! (Face plant … right into the tulips.) But when I am looking down the trail with positive expectations, the ride flows and is fun. I see a lot of negativity among my diabetic friends. Some call this “realism,” but the truth is you can make your realism either positive or negative; it all comes down to how youÂ think.Â When I am thinking negatively on my bike, I’m most likely to have a bad fall. When I’m thinking positively, the ride is fun. My life with diabetes isÂ fun. It’s exciting, thrilling, adventurous. Yeah, I crash sometimes. Yes, sometimes I have “mechanical failures.”Â But as I do on my bike, I make the necessary changes, get back in the saddle, and keep pedaling! All this helps me beÂ prepared, so IÂ donâ€™t freak out at little challenges or even big obstacles along the trail. In other words, no more endos. How are you doing? Are you being proactive with your diabetes care? Are you looking down the trail? What are some of your goals, strategies, and plans? Mike- This is just plain awesome! Love your perspective, and will go back to these words after my next “crash moment”! Thanks, Tom. On my way out now for a road spin. Beautiful day here in Louisville. Excellent post, Mike. Enjoyable read. Thanks, Ed! I’m sure you already knew about these mountain bike skills!